A heavy workload has led a South Shields actor to quit his roles in a top TV hospital drama. George Irving is leaving his role as consultant surgeon Anton Meyer in the BBC’s Holby City next week. His decision comes as a result of the shows demanding workload and in an increase in the number of episodes filmed, the gazette can reveal. 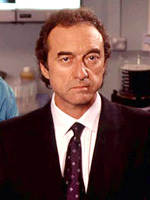 The 48 year olds final storyline sees him investigated for malpractice by his greatest rival Tom Campbell-Gore, played by Denis Lawson. Despite his exit, the BBC has not killed off his character – leaving the door open for a possible return. Meyer has been described as confident, arrogant, single minded a great humanist and a perfectionist when it comes to his work as a surgeon. George who was born and raised in South Shields, lived in Sycamore Avenue and went to St Joseph’s School in Hebburn. His ambition and a youngster was to go to college and study human biology or biology. But one Saturday when he was working in a supermarket to make some extra pocket money a friend offered him a chance to join a drama group. He went on to become a stalwart with South Shields Youth Theatre and made regular appearances at Sunderland’s Empire theatre. His TV career began in When The Boat Comes In, where he played the role of Sid Hepburn. More parts followed in Eastenders, The Bill and Casualty. He played the role of a police officer, Ken Jackson, in an early series of Dangerfield, working alongside Lisa Faulkner who later went on to star in Holby City. The married father of one lives in east London but still keeps in regular touch with his dad George in South Shields. His future plans are not known. His last appearance can be seen on Thursday at 8pm on BBC1.